We have been desirous of buying oil and eventually we may want to look into Natural Gas. There is a problem though… Contango. This creates a problem for anyone investing in oil or several other commodity investments, especially when investing through ETFs and ETNs. The reason is that the wider the Contango spread, the more potential that the monthly roll to the forward future will chip away at share value for an ETF and an ETN. Below is a story that discusses this from Bloomberg as well as a chart that we put together that shows just how badly the Natural Gas investment (UNG) has done comparably. June 12 (Bloomberg) — The United States Natural Gas Fund, the first and largest exchange-traded fund for the fuel, attracted record volume yesterday as investors bet rising prices will reward them with a comparable return. They may be setting themselves up for a disappointment. The fund doesn‘t try to match the spot price of the commodity. Its goal is to follow the percentage change in the price of the commodity‘s front month contract, said John Hyland, portfolio manager and chief investment officer of the fund. When the market is in contango, meaning the near month contract is cheaper than the contracts further out, the fund will underperform the underlying commodity, he said. Investors see “natural gas” in the name of the fund and assume the fund mimics the commodity‘s performance, said Paul Justice, an ETF strategist at Morningstar Inc. in Chicago. That‘s not the case. 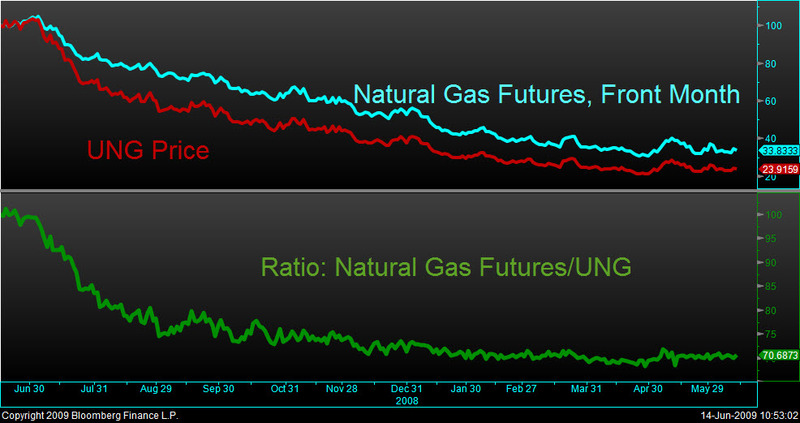 The chart below shows how severely UNG underperformed the actual commodity. This is a good lesson to anyone who invests in a commodity based exchange traded investment as Contango can be a major drag on performance.